Super-quick recap for my first review in about a week. I'll be back to normal reviewing sometime in the next day or two. Real life smacked me down the past few days!What can I say other than I have a serious thing for Kevin Hearne. This man writes books which make me happy. End of story. 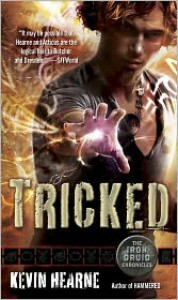 Onward to book 5!With no time to review for this book tonight, here's my thoughts on book 1, where I first fell in love with the series : Book 1 - HoundedHighlights from Tricked :"I just shook hands with a naked goddess. What was that she called you? She-ya-han? Does that mean dumbass in Old Irish or something? ""No, that's my real name. Maybe it does mean dumbass, though. Keep calling me Atticus. "Atticus : Where am I going to find half a yak?Oberon : Duh. Attached to the other half. Hound 1, Druid, 0.Atticus : Saint Lassie smiles upon me!